I love a good party and I had the best excuse to throw one – my younger sister is getting married! That means a bridal shower was in order! Yay! Disclosure: Sweet Chatter may be compensated from affiliate links and/or purchasing products from the links posted on this website. Get your FREE Bridal Shower Planning Checklist here! Start planning your perfect party! My mom, twin sister and I decided on a Kate Spade Inspired Bridal Shower theme. This means the famous boldness of the black and white staple colors with the glittery golds and standout pinks sprinkled in! We all decided on Brunch and Bubbly! It’s hard to say no to something like this. Between the three of us, nothing was missed and it turned out perfect! There was a mishap or two setting it up, but nothing that the guests knew of… thank goodness! After the decision was made we decided on invitations. 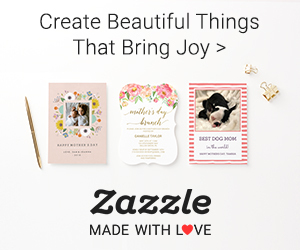 You won’t find better invitations anywhere than zazzle.com! You can customize them the way you want them and make them perfect for your party! Planning the perfect Bridal Shower means taking time to ask questions and getting a feel for what the bride likes. It doesn’t have to follow the theme of the wedding. Just give it a good “feel” of what the bride likes. It could be bright and fun or classy and put-together… or both! That’s what the Kate Spade inspired theme we picked is all about! First job duty? Find out what the bride likes. Flat out ask her point blank – what is your vision, what theme were you thinking of for your Bridal Shower and how would you like it? OR you can kind of tip-toe around it if you want to keep it more of a surprise. You can ask the bride different questions about what she likes… favorite flowers, favorite color, favorite designer, favorite shape, etc. Then put a surprise together for her! You will also want to know if she wants an all female shower or a co-mingle shower. That’s definitely important to know too! From here choose a date and compile a guest list. The theme of this shower was Kate Spade Inspired (as you already know) and females only – she wanted a girls day! A huge question is where will it be held? You can really choose anywhere. Mine was at my parent’s house, but my sister lives in awesome apartment complex right on the edge of City Park, Denver, that had an amazing gathering room overlooking the park. It was perfect! The size, the set-up, everything was just right! The next line of business? What and when – morning, afternoon, evening, lunch, brunch? The timing will pretty much fall into place after deciding what kind of party. When: Naturally at Brunch time! We chose an 11:00am start time. Food comes next. It’s a very important part to the whole thing. It’s where guests can fill their plates and stomachs and catch up with friends and make new ones! Questions you might ask are: Is it something you want to get catered in? Do you want to serve just apps or a full meal? Or, do you feel confident enough to take on the task yourself? We were! My sister, Chelsea, went to school for a Chef and Pastry Arts degree. She pretty much did it all and it was (to say the least) outstanding! The menu consisted of a waffle bar with toppings of whipped cream, sprinkles, mini chocolate chips and chopped pecans. We also had bacon, sausage, egg muffins and sliced fruits. Don’t forget the cake! Every party my sister hosts, the cake is where it’s at – the centerpiece! I think this was her best work yet, so fun and elegant and simply gorgeous! The best part though is eating it, it tastes even better than it looks! She also made amazing Red Velvet Sugar Cookies too for snacking. What to drink…! With the theme, Brunch and Bubbly, it’s not a part that can be overlooked. A Mimosa Bar sounded just perfect! Champagne was purchased and we had four different juices or purées guests could mix into their glasses. We offered the traditional orange juice and also had peach, strawberry and blueberry purées. For kids and those that didn’t want alcohol, sparkling water and alcohol free champagne were offered. For my girls, having a pretty drink like everyone else made them feel included and so important! Next? The fun part. It’s all fun, but the even more fun part…! Decor! Balloons! First, a small thing to take into consideration though, not really… a HUGE thing actually – what does the room look like? How is it set up? How many tables are there? This will give you your guidance for what you need. We knew we needed three table cloths and needed to bring an extra table. We were also able to rearrange the existing furniture so that all could mingle in little pods, yet when it came the time where all eyes were on the bride, everyone could see. To decorate, we had black and white accents such as bowls and vases, the plates and cutlery were glittery gold as well as the champagne glasses, shiny paper ring cut-outs were placed all over the room, we placed paper-poofs around the room and we also had balloons! The bride can’t identify a party without balloons! It was a must! Games – the bride did not want long embarrassing games. She really didn’t want any games at all, but prizes are always fun! So, we looked and found two very low key, almost passive games. For the first one we set up a jar full of Hershey’s kisses and whoever guessed the amount closest to what was in the jar won a prize and got to keep the jar of candy kisses. The next game was a hide a seek game. We hid – my girls, a two and five year old – actually hid 25 rings around the room guests could find. Whoever found the most won! My daughter, Hope, of course was the winner… she didn’t understand that she hid them all and couldn’t win! However, she was ok with giving the prize to the runner up after being a little reluctant! There are so many different games to fit any personality. It would definitely recommend at least one or two games. They are fun and interactive and there are prizes…! Presents. This is ultimately why a shower is hosted! We set up a table just inside the door for them all and it was the last activity on the agenda. We sliced the cake and guests could eat while the presents were being opened. It was a little chaotic because an excited two and five year old were involved, but it was fun. I always love seeing what was given and love to find out about cute things I might need in my life…! Party favors. My sisters love Cotton Candy so much. There was no asking, no discussion, no second guessing – cotton candy was it. We knew as soon as Catrina got engaged! There is an amazing lady that sells adorable single serving cotton candy pops on Etsy. My sister has used her multiple times, at least three or four times now. She makes a wide variety of different colors and can personalize them to your liking. They are so cute and taste absolutely amazing. Want more ideas for favors that fit your Bridal Shower just perfect? Bridals showers are fun and memories that will last a lifetime are made! Impress your guests! Find the recipes here for the Red Velvet Sugar Cookies the Two-Ingredient Royal Icing to make for your next event!